New Shows Available for ALL Customers! 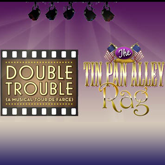 THE TIN PAN ALLEY RAG and DOUBLE TROUBLE are now available for performances by ALL customers. 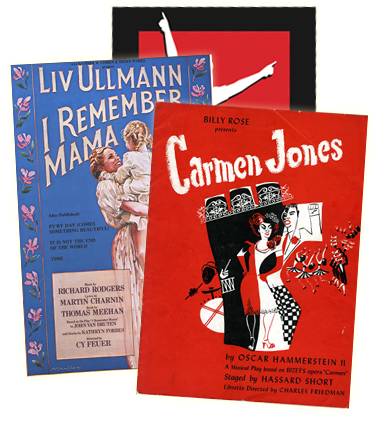 THE TIN PAN ALLEY RAG is a musical play which focuses on a fictional but plausible meeting between Irving Berlin and Scott Joplin in the early 20th Century in New York City's Tin Pan Alley. The aging Joplin happens into young Berlin's office in search of a publisher for his opera, TREEMONISHA. The ensuing musical highlights influential and emotional moments from each of their lives, contrasting the ironic similarities and differences between the men. While Joplin received a conservatory education as the prodigy of a father born into slavery, it was Berlin, the Russian immigrant who couldn't read music, who had his first international hit song at the age of 23. What becomes clear is that both Berlin and Joplin possessed musical gifts beyond measure and shared a passionate humanity, both of which are beautifully showcased and illuminated in THE TIN PAN ALLEY RAG. DOUBLE TROUBLE is a Musical Farce set at a Hollywood Film Studio in the 1940's. Jimmy and Bobby Martin have the opportunity of a life time writing a song for a major motion picture except they have only a few hours to do it. From the creators of the hysterical revue MID-LIFE! THE CRISIS MUSICAL, DOUBLE TROUBLE (A MUSICAL TOUR DE FARCE) is a spoof of 1940s Hollywood in which 2 performers play 10 different larger than life characters. Written and originally performed by Bob and Jim Walton, this tale of singing, dancing and song-writing brothers, is sure to get you laughing and your toes tapping.